On September 11, 1972, crowds lined up for hours to be the first passengers aboard the sleek and high-tech trains of the new San Francisco Bay Area Rapid Transit system. In the lead-up to the opening, newspapers had envisioned a gleaming future for train travel in America. One wire report asked readers to imagine "traveling 30 miles in 20 minutes, relaxing in a soft lounge chair, reading a newspaper during the smooth ride." One headline announced "Transit System for Space Age." The new BART trains lived up to that visionary billing: the spaceship silver, the hexagonal shape of the cars, and the plush aqua interiors had a sci-fi sort of feel, like this was the kind of train that would someday whisk you across cities on the moon. A full 42 years later, those same exact train cars are still on the tracks, and they don't feel so futuristic anymore. A lot more people are riding BART today than during the system's early years. Average weekday ridership is now about 400,000, up from just over 100,000 in the late 1970s. And though the 1972-vintage trains have undergone remodeling and the system has been augmented with a few dozen newer trains, the overall state of BART trains is old, crusty, and cramped. "We have old cars," says Aaron Weinstein, the agency's chief marketing officer. "Our fleet is one of the oldest in the nation." There have been considerable advances in the technologies used to make train cars over the last four decades—from seats that are easier to clean to communications systems that can display information dynamically to lighter structural materials that reduce energy demands. Train operators around the world understand these changes, and periodically update their systems with newer models of train cars or better signage systems. Washington D.C.'s Metro system will be integrating brand new train cars to its system next summer that feature floors that are easier to clean and handrails that reduce clogging around doors. Chicago's CTA will begin adding 800 new cars to its fleet in 2019 with designs that remove unpopular center-facing seats. Nearly half a century after the system's launch, BART will get its own long-awaited makeover. The so-called "Fleet of the Future" plan will put between 775 and 1,000 new BART cars on the tracks between 2017 and 2023, at a cost between $2.5 billion and $3.3 billion. But the overhaul is more of a full reimagining than a cosmetic touchup—from the big-picture look of the car itself to the minutiae of floor patterning and handrail grips. BART used the chance to rethink how the trains look on the outside and feel on the inside, how they accommodate the crowds of today and the near future, and how they subtly control rush-hour crowds and all those bicycles. The designers behind this project are focusing on the many minor details that together make a train ride either smooth or crowded or terrible or great. In other words, BART asked what the redesign can do not only for its train cars but for the system as a whole. It's industrial design mixed with interior design, plus a splash of social engineering. And with the right touch, BART might even be able to hold on to that futuristic feel for another 40 years. The process of designing the Fleet of the Future began in 2009. Initially it was less about design than data. BART looked at various rider data and surveys that it regularly collects to begin figuring out what the system and its riders needed and wanted from a new train. Weinstein says the agency surveyed how riders felt about the existing cars. They asked riders to email ideas for improving the cars, and to send pictures of elements they liked from other transit systems around the world. They conducted "seat labs" in stations to let riders test out different seat spacing arrangements—a matter of inches and centimeters that determines, to a large degree, the entire spatial design of the car interior. They even shipped in loaner seats from metro systems in Boston, Washington, and Los Angeles to give BART riders the feel of different seat designs. BART looked at demographics, too, says Weinstein. The agency considered how population growth rates would affect the demand for trains, and how the aging Baby Boomer population would affect the need for seats designed for seniors and people with disabilities. It also considered BART's scattered geography. The system serves as both an urban metro system and a regional commuter system, which can result in a dramatic difference between its weekday riders and its largely leisure- or tourism-based weekend riders. Meeting the needs of these various groups requires a good understanding of how each group uses the system. So when BART contracted BMW Group DesignworksUSA in March 2011 to create the conceptual design for the new train cars, the agency first handed over all its ridership data, surveys, and observations. Weinstein says the data-rich approach is critical to making sure the new designs will actually benefit the people who use BART. "We're planning on ordering up to a thousand of these cars," he says. "We can't really afford to be wrong." BMW Group DesignworksUSA, you might rightly guess, designs a lot of BMWs. Though a subsidiary of BMW, DesignworksUSA spends half of its time on projects for other clients. It's designed a computer mouse for gamers, lawn mowers for John Deere, and a mega-yacht for a mega-millionaire, among other things. Much of the work centers around transportation of one sort or another, and much is on display in its offices 50 miles northwest of Los Angeles, in Newbury Park, the kind of exurb built for corporate offices. When I visited the DesignworksUSA studio in late July, creative director Johannes Lampela offered an example of the level of detail given to design projects such as the new BART cars. He showed me thematic collections of swatches of materials—fabrics, carpeting, metals, plastics—all of which were intended to represent a specific feeling or place or lifestyle. One was breezy, one was more mechanical, another was earthy, and another somehow conjured the feel of a nightclub with $18 cocktails. These were the initial composites from which an overall design aesthetic is based. Though color schemes and tones of plastic and floor coverings are all important elements of train design, the guiding element is the seating arrangement. Lampela ran through the three design concepts he and his team created for BART. They were essentially those swatch palettes exploded out into every nook of a train car: a seat-heavy version named Commuter Comfort; a more open and airy version named Social Interaction; and a colorful car with customizable elements called Reflecting the Community. When BART showed the three options to riders, most preferred the Social Interaction design. Lampela agreed this flexible arrangement is well-suited to BART's wide variety of riders. "We've created a central area that is more social, more lounge-like, and then we have more typical commuter seats in the back, so this allows for the longest distance commuters that enter the train first to sit in the more comfortable seats," he says. As the train fills, more people will sit in the L-shaped seats in the center of the car, and eventually stand in the empty space between them. Colors on the floor of the train distinguish the leg space of someone sitting in a seat from the standing area for another rider. Lampela said these subtle differences can play a big role in guiding how riders position themselves. "We can start directing traffic differently," he says. The doors themselves are an innovation: When closed, they create suction with the car and reduce the amount of ambient noise. The design encourages more people to load into the center of the car, where there's more room for standing. Because BART expects its ridership to continue to grow, packing in more people is a priority. To make that easier, BMW Group DesignworksUSA designed a third door in the middle of the car. The design directs riders with bicycles to enter at the center doors, where there's more room and new bike racks, while wheelchair users are directed to use the doors at the ends of the car. The doors themselves are an innovation. Similar to the sliding door of a minivan, the new doors slide together and pull back in when they close, creating suction with the car and reducing the amount of ambient noise inside the moving train. The designers also paid close attention to the way riders choose and use seats. During a research ride at rush-hour, designers observed the two rows of bench-style seats on the current BART cars and noticed that aisle and window passengers tend to lean away from each other. "Those kinds of observations led us to make the side-by-side seats in the new cars more separate," says Lampela. They added a narrow strip of plastic material between the seats, creating a small but visual separation. "Even something very thin that separates seats gives more social comfort." Even after riders voted on their favorite concept, the DesignworksUSA design faced additional scrutiny. Weinstein says riders were surveyed on the final concept, and they offered thoughts on nearly every aspect of the design, including the exterior appearance, the floor, the digital screens, lighting, handrails and stanchions, the color scheme, and, of course, the bike rack. All this feedback helped to revise the concept. But a concept is not a train. In 2012, BART contracted the train manufacturer Bombardier to handle the transition from conceptual design to physical train. Bombardier believes a train design must promote safety, offer comfort, and remain within the confines of the client budget—in that order. Given that rubric, conceptual designs don't always translate perfectly into a manufacturable train. Daniel Deschenes, an industrial designer at Bombardier who supervised the bid and the start of the BART project, says it's common for small design details to get tweaked during the manufacturing phase. Whether it's the foam used for cushions or the protective material on the back side of the seats, many little changes are made, often due to cost constraints. The manufacturer also has to pay attention to things like the weight and quantity of the materials being used, like stanchions and handrails. "The weight you add you carry each and every day for 30 or 40 years," he says. "That's a lot of energy." Though most of the changes to BART's design were small in scale, some bigger ideas from the conceptual phase didn't pencil out. One design idea included a rim of light around the front face of lead train cars that could change based on the route—yellow for the Pittsburgh/Bay Point line, for instance, or orange for the line connecting Richmond and Fremont. It was a good usability concept, says Deschenes, but the price point for the light technology was just too high. "The technology wasn't there yet, so we had to remove that feature." The evolution of train design is somewhat slow, especially compared to an industry like personal automobiles, says Deschenes. That means new technologies and products—from light rims to train-length digital displays to curved screens—can be hard to implement. "The non-recurring cost is really a different story in our industry than, for example, the car industry, where you can spread it over two million units," he says. "We can't do that." Even the all-important seat layout is up for review in BART's cars. Though Deschenes says this part of the design is usually set in stone by the time a train project nears prototyping, Bombardier had to adjust the placement of wheelchair space so it removed only two seats rather than three. "Revenue seats," as they're known, are important to transportation authorities, so Deschenes and his crew made it work. The BART design is getting close to final and the project is edging its way toward production, but even after more than five years of ideas and designs and adjustments, more changes are practically guaranteed by the time the first cars start rolling. In April, Bombardier built out a full-scale half-car model for BART to show off to its customers. The sample car made the rounds to different stations throughout the Bay Area for riders to see, enter, and try out. Though this seems as close to a final product as you can get, it's actually just another step in the long process of surveying the public about the design. Weinstein says the agency continued to collect feedback from people about the design at these events, especially from wheelchair users and bicycle riders. The placement of the floor-to-ceiling stanchions in the center area between the doors came under fire from wheelchair users, who found them difficult to maneuver around. Bicyclists worried that the proposed three-bike rack might not provide enough space. Weinstein estimates that nearly 35,000 people have provided feedback or survey results during the five-year design process. And the process continues. "As much as you stare at a set of specifications or a rendering for hours on end, you don't always see everything." "As much as you stare at a set of specifications or a rendering for hours on end, you don't always see everything," he says. "And now we've had tens of thousands of eyeballs on our work, and people see things that we don’t see, or have different needs than we have in our use cases." At its June meeting, BART board members voted to approve some last-minute changes to the proposed design. Bombardier is scheduled to deliver 10 pilot train cars in the summer of 2015 for testing. As a result of the recent concerns over wheelchairs and bicycles, two different internal layouts will be manufactured—one with the poles moved two more inches off center to create more room for wheelchairs, and another with both poles and bike racks removed to create larger open spaces. BART is expected to test these pilot cars in revenue service in the fourth quarter of 2016. Ultimately, the first 100 new trains are expected to arrive and begin service in 2017, with the remaining cars—for a total of up to 1,000—to be delivered on a rolling basis through 2023. Exactly how these trains will look is almost finalized, but the back-and-forth design and manufacturing process may continue right up until the first new BART cars arrive. Which is probably for the best. 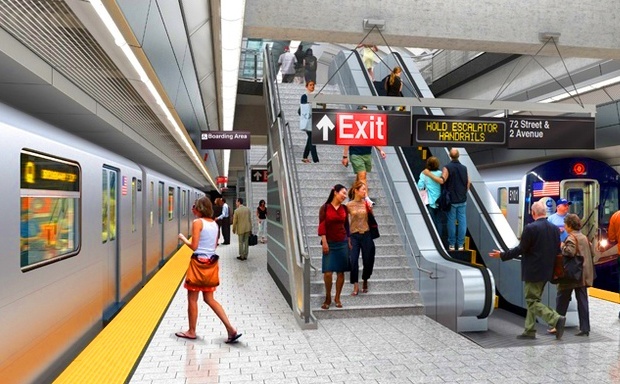 The BART riders of the 2050s are depending on the right decisions being made today.